Jordan Gill and Emmanuel Dominguez Final Press Conference ahead of their fight for vacant World Boxing Association International Featherweight Title on saturday night. 27th February 2019 Picture By Mark Robinson. “Hello everyone and thank you for joining us here in Peterborough today ahead of a stacked JD NXTGEN show on Saturday night at the East of England Arena. It’s the start of a busy month for Matchroom Boxing. From here we go to Milan, New York, Philadelphia, London and then back to Liverpool. It’s a busy month live on Sky Sports and DAZN. “These are the kind of cards that are really going to build up the sport of boxing and the new names of boxing in the UK. We’re very excited to try a new market here in Peterborough. There’s over 2,500 tickets sold and this man to my right (Jordan Gill) has sold 1,200 of those. I think he deserves a round of applause for that. “This is a really big step on the ladder for me. To be headlining in Peterborough so close to my home town is a dream come true and to have such a good card behind me is a dream come true as well. Thanks to Matchroom, thanks to Eddie, thanks to Frank. Also thanks to my manager Dave Coldwell who has worked very hard to get me here. It’s been a long road and I’m just really excited. I’ve had so much support locally – everyone is coming out to watch it. It’s a good arena, its like a big tin shed with a low ceiling so there’s going to be plenty of noise in there. I’m looking forward to soaking up the atmosphere. “It’s really nice to be here. Thanks for the welcome. This is the first time that I’ve set foot on British soil and it’s been great. I’d like to thank the promoter of this event Matchroom Boxing for this fantastic opportunity. I think that the experience that I’ve gained fighting in Mexico will help me. Every fight I’ve had in Mexico has been against a really tough opponent. I think it’s very important that I’ve got that backstory. Those tough opponents have helped me develop this massive hunger that I’ve got. I’ve come here to win and I’m carrying that belt back to Mexico. “First of all I want to thank my manager Dillian Whyte for getting me this opportunity. It’s like a dream come true. Boxing on small hall shows at York Hall to fighting on the big stage. I’ve fought on a few of Dillian’s undercards and the Usyk vs. Bellew undercard where I won my first title against Sam Hyde in Manchester. I’ve become like a reference to people all over the World. If you dedicate yourself and strive for greatness then your dreams will come true. It takes a lot of sacrifice and discipline. I’m happy to be here, I’m looking forward to the challenge. “Thanks for having me and thanks for the opportunity. I feel good, I’m happy to be here and I’m very confident. I’ve been waiting for an opportunity to be on this stage for the past two years. My career got off to a very good start and then it was very stop-start. I feel like I’m back where I belong, fighting in Championship fights on TV. This is a big opportunity and I’m not going to let it slip. I’m ready, I’ve been looking World class in the gym. I’m excited. “I’m very excited. I’m sure it will be an exciting fight on Saturday night. I want to thank Dave Coldwell for delivering this fight for me. Jordan played his part in making this possible and Matchroom Boxing as well. It’s been hard with fights falling through – I was getting a bit down about it all. I’m here now and I’m being trained by Ian Grant. He’s had me all over the place, down in Wales, Nottingham and Sheffield training, he’s even had me down at the National Space Centre training at zero gravity. I’m buzzing, I’m happy and excited. I just want to get in there now and show everyone what I’m about. “I’m feeling good. I’ve had a very good camp, sparring the likes of John Ryder. I’ve got a good journeyman in front of me on Saturday, he’s very slick and he’s not been stopped many times. The Doc is going on the hunt for another knockout and hopefully I can get four knockouts in a row. I’m looking forward to Saturday night and a big performance. “Ricky Burns is in the gym with me every day and he’s always pushing us on in every session. He wants to do extra work all of the time and that’s the reason he was a World Champion. He’s coming up to watch me on Saturday so hopefully I can put a show on for him. “I’m really enjoying the pro ranks. I’m having a good time in training and enjoying my boxing. As they say, a happy fighter is a dangerous fighter and I’ve been getting better in every fight. I’ve had a good camp. This kid is a good opponent. He’s got more stoppages than I’ve had fights so that shows how talented and experienced he is. He’s just another hurdle in the way and I’ve got to get over it on Saturday night. “As you can see they’re already pushing me very fast – my opponent on Saturday is very experienced. I’m ready for titles whenever my trainer, management and promoter feels I’m ready. Let’s push on. It’s my second year as a pro and I want to get better and better with every single fight. Today marks ten years since my professional debut fight on 28th February 2009 and today is the day I am announcing my retirement from boxing. It’s been an unbelievable journey and I’ve had an amazing decade – if I’m honest, the best years of my life – and having started boxing at the age of nine then being selected as part of the England Amateurs squad, I’ve collected many memories along the way. It’s hard to admit that I’m not the fighter I once was, but I’m human and along the way, my injuries have taken a toll – both on mind and body and these things have contributed to impact my performance in the ring.I lost the fight on Saturday at The O2 but I’m touched to have a good send off from the fans in my home city. The day after the fight, someone said to me that one fight does not determine a legacy. Looking back, if someone had told me at the start of my boxing career, when I was in the England squad, that I would become an Olympic Gold Medallist, British and European Champion and Two-Time World Champion, I would never have believed them, but I did it and I’d like to think I did it the clean, honest and hard way with discipline and respect to the sport I love. I’m proud to say that I’ve made history as the first ever British Olympian boxer to turn professional and to win a World Title and I am also proud to have been a road warrior – to travel wherever I needed to be to fight and to win. There’s nothing left to prove.A majority of the greats go out on loss and for me, it’s time to hang up the gloves and to move on with my head held high. Firstly, thank you to all of my fans and supporters – it’s been great to meet some of you along the way – thank you for your support – it’s carried me to the top! To the media … there’s too many of you to thank personally but thanks for the coverage and for the jokes along the way. A special mention to Richard Maynard, you are a true gentleman and a pleasure to work with. The major U.K TV networks that my fights have been televised on: Sky Sports, BT Sport, Channel 5, BBC and I’m happy that I ended on ITV. Showtime in the U.S who have a fantastic team that have featured me plenty of times. Special thanks to: My family and friends who have cheered me along from the start. Your loyalty and encouragement is second to none. I thank you from the bottom of my heart. To my trainer Jimsky – we did it Jim and we saw it through together – thank you for all your love, time, patience and advice. To you and all the McDonnell family – this is not goodbye – we will be friends & family for life. Nick Palma – you came onboard more recently and I value the support you’ve given me during our sessions together – thank you. Paulie Malignaggi – thank you for coming on board and for sharing your wealth of knowledge and experience of the sport. I always appreciate your direct honesty and support and consider you a friend for life. Steve Newland – thank you for picking me up, brushing me and down and starting all over again and for believing in me – I wouldn’t be where I am now if it wasn’t for you. Joseph John – my sidekick and my true friend who tells me what I need to hear rather than what I want to hear – I appreciate your friendship. Thank you. My eternal love and gratitude goes to my Mum and Dad for being there through thick and thin from the very beginning – I couldn’t have done this without you!To my siblings – my Sister Eloise (Smells) for being at my beck and call 24/7 – thank you! My two brothers Alex and Lewis and my cousins Jacob and Rian who stood in the background and willed me on and wanted me to succeed no matter what – thank you! Last but not least THE MAN, THE MYTH, THE LEGEND, the family man – Alan Haymon for supporting and guiding me through the last chapter of my career! You put the boxers first! I will never forget you. Thank you to each and everyone one of you for the part you have played in my career and in making me THE ROAD WARRIOR, THE HISTORY MAN!Thank you for the memories – over and out. 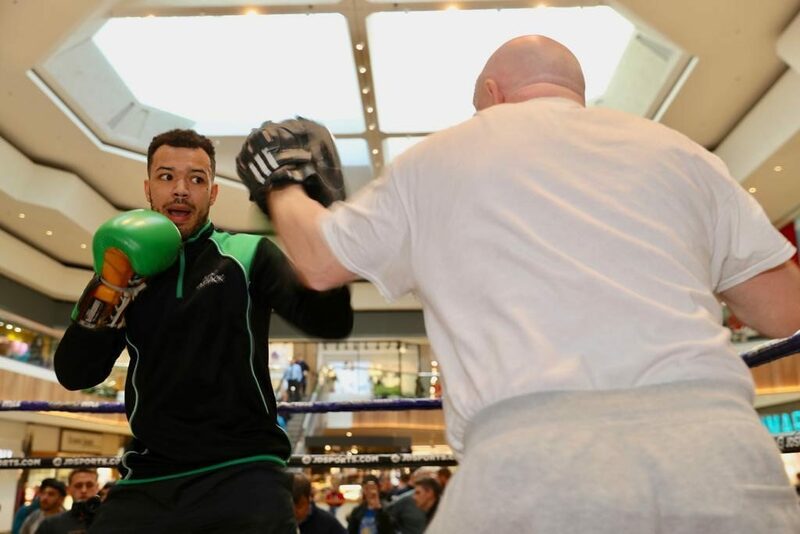 Tommy McCarthy says he has nothing to worry about ahead of his crunch Cruiserweight showdown with unbeaten Richard Riakporhe at the East of England Arena in Peterborough this Saturday. Belfast’s McCarthy takes on the Dillian Whyte-mentored Londoner for his WBA Inter-Continental title in the latest instalment of the JD NXTGEN series, live on Sky Sports in the UK and DAZN in the US, and insists he is unimpressed by his opponent’s record. “I haven’t seen anything I’m worried about,” said McCarthy. “I think he’s limited, he’s like a big novice boxer if you watch him. He has seven knockouts but he hasn’t fought anybody. That last knockout against Sam Hyde wasn’t a knockout because Sam had to be pulled out by his corner because he had a bad injury. Former Commonwealth Games silver medallist McCarthy is looking to impress in his first live television appearance since 2016, and the 13-1 talent believes a win over the well known Riakporhe would fire him straight in to the World title mix. “It’s a big big opportunity for me. It’s a fight that I believe I can win. A win here gets me in the top ten in the World with the WBA , it’s really exciting. It’s an opportunity that I’m going to take with both hands. “If you get into the top ten that’s make you eligible for a World title shot. The talk is that Oleksandr Usyk is going to move up to Heavyweight and vacate his World titles. We’re looking at the possibility of wining this and maybe by the end of the year being in World title contention. It’s all up for grabs, it could be anyone. Riakporhe vs. McCarthy is part of a huge night in Peterborough. Jordan Gill takes on Mexico’s Emmanual Dominguez for the WBA International Featherweight crown in the main event. 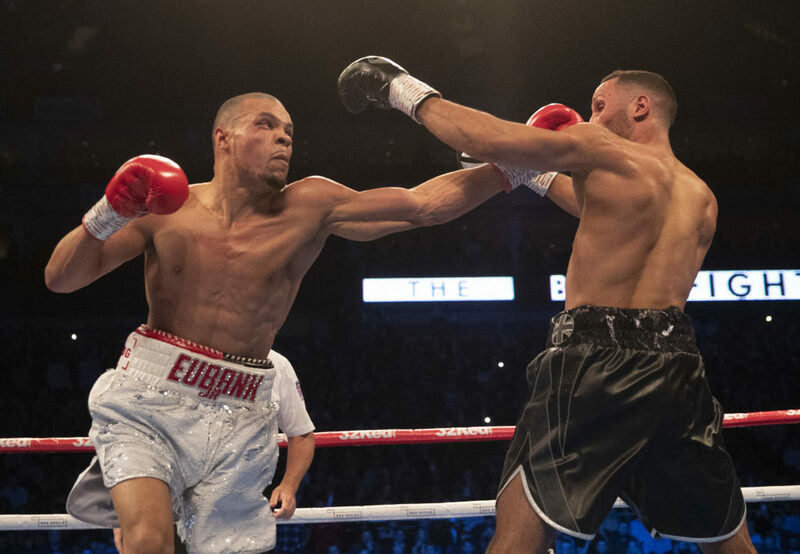 Unbeaten Indiana Super-Middleweight contender Anthony Sims Jr fights for the second time in the UK after an explosive debut in Cardiff last summer. Jordan Gill is determined to break into the World rankings with a win over Emmanuel Dominguez on Saturday. ‘The Thrill’ takes on Mexico’s Dominguez for the WBA International Featherweight crown at the East of England Arena in Peterborough, live on Sky Sports in the UK and DAZN in the US, and is expecting a tough nights work. “He’s been around, he’s seen a lot of things in the ring, and I don’t think he’s going to be too bothered about coming over to England and facing me,” said Gill. “He’s experienced. He’s only been stopped once and that’s by a current World Champion as well, who just beat Isaac Dogboe for the WBO title. The unbeaten 24-year-old can propel himself among the WBA’s top contenders by taking out Dominguez, and he is eager to push on with his career after claiming the Commonwealth title with a punch-perfect win over Ryan Doyle in his last fight.”That’s what it’s all about. I didn’t get into boxing to become a Commonwealth Champion, even though I’m over the moon to be a Commonwealth Champion, it’s not the end goal. “I want to move on to World level, and this fight puts me in the mix, in the top 15 with the WBA, and we can pick a route towards a World title.”As a fighter, you want big fights. You want to be involved in all the fights that people are talking about. Not many people are talking about divisions other than the Featherweight division, because it’s probably the best division in boxing at the moment.””I can reach the top, I’m one hundred per cent confident of that. I’m confident that I will be there, and be there quicker than people imagine. I’m taking one step at a time. I’m fighting one fight at a time, beating one man at a time.”Whatever happens, happens, but I know with the team I’ve got around me, and the way that I’m improving in the gym, that these sort of fights and these sort of accolades aren’t out of the question at all.”Gill vs. Dominguez tops a huge night of action in Peterborough. Richard Riakporhe makes the first defence of his WBA Inter-Continental title against Belfast’s 12-1 Tommy McCarthy. 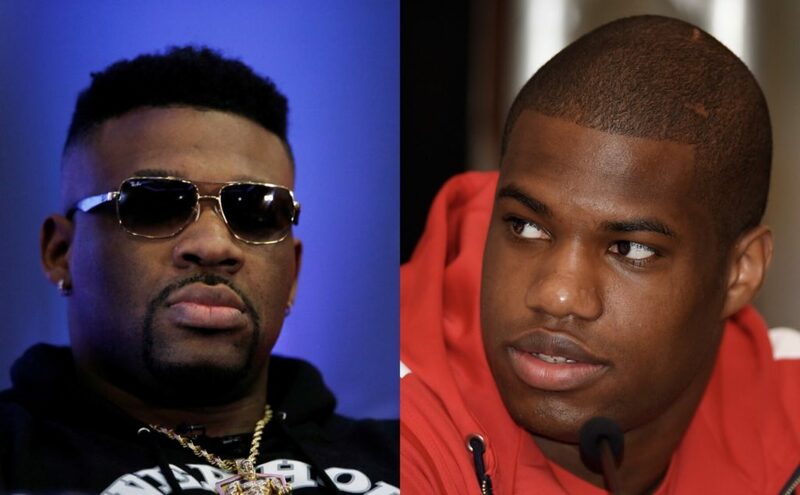 “I wanna say one name, I heard the kid’s a badass – Daniel Dubois.“I like the kid, I like him a lot, I like his energy and I heard he’s thumped AJ a couple times down in the gym as well, too. 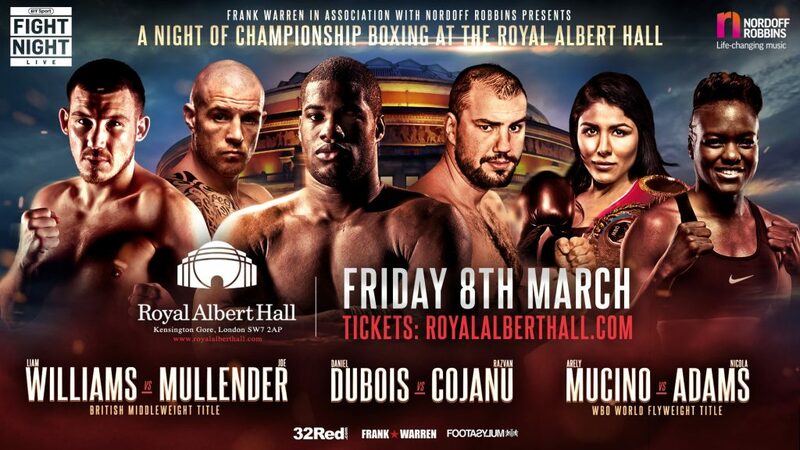 Daniel Dubois v Razvan Cojanu and Anthony Yarde defending his WBO Intercontinental light heavyweight title against Travis Reeves tops a huge night of boxing at the Royal Albert Hall that also includes the British middleweight title clash between Liam Williams and Joe Mullender, while British welterweight champion Johnny Garton makes a first defence of his belt against the Welshman Chris Jenkins. Unbeaten featherweight Lucien Reid takes on his toughest test to date against Birmingham’s Indi Sangha. Unbeaten prospects Hamza Sheeraz, Denzel Bentley, Jake Pettitt, James Branch jr and Harvey Horn also feature on the show. TRAVIS REEVES will be motivated by his trainer Hasim Rahman’s shock win against Lennox Lewis when he faces Anthony Yarde. Rahman caused one of boxing’s biggest ever upsets when he became IBF and WBC champion back in April 2000, knocking out Lewis in five round. Reeves (17-3-2) will attempt to cause his own stunner when he challenges Yarde (17-0) for the Ilford man’s WBO intercontinental light-heavyweight title at London’s Royal Albert Hall on Friday March 8, live on BT Sport. He believes Rahman’s stunning win and his tough Baltimore boxing roots will play their part when he faces Yarde in only the second professional boxing show at the famous venue in more than 20 years. Reeves said: “Look at Hasim Rahman when he beat Lennox Lewis. Like him, I am coming to win. “You look at the fighter who have come out of Baltimore like Gervonta Davis, Jarrett Hurd, Vincent Pettway and Hasim Rahman. “We are just a different breed and we do not come to lay down. Win, lose or draw you are going to know we’re there. “I can’t give you too much, but wait and see what I have got. It is definitely going to be an exciting fight. Besides having Rahman in his corner, Reeves is also trained by Vernon Mason who ironically fought John H Stracey at the Royal Albert Hall in 1974. Reeves added: “I follow boxing and London has played a big part in the history of the sport. I can’t wait to put on a show for fans there. Yarde’s WBO intercontinental light-heavyweight title defence against Reeves takes place at the Royal Albert Hall on Friday March 8, live on BT Sport. Daniel Dubois v Razvan Cojanu and Johnny Garton defends his British welterweight title against Chris Jenkins on a huge night of boxing that also includes the British middleweight title clash between Liam Williams and Joe Mullender. Also on the bills is unbeaten featherweight Lucien Reid, who takes on his toughest test to date against Birmingham’s Indi Sangha, while unbeaten prospects Hamza Sheeraz, Denzel Bentley, Jake Pettitt, James Branch jr and Harvey Horn feature on the show. CONFIDENT American Travis Reeves has hammered Anthony Yarde telling the British hope: You’ve fought nobody.Reeves (17-3-2) challenges Yarde for the Ilford man’s WBO intercontinental light-heavyweight title at London’s Royal Albert Hall on Friday March 8, live on BT Sport. Speaking on the latest episode of ‘The Boxing Podcast’, available to download on Wednesday, Baltimore’s Reeves affirms his belief he is levels above Yarde’s previous opponents and insists: “I am not worried about Yarde. “From a fans perspective, everyone has got caught up in the hype, but most of those guys he fought, they were nobodies. “Why wouldn’t I be the man to beat Anthony? I have got the skills and faced people like him already, but feel he hasn’t faced anyone like me. “I feel that every fighter Anthony has beaten I would have knocked out. “That is why I am not overly concerned or worried about him. I would have done the same thing to the guys he fought. “I understand the hype that they have to present when they are building up a guy. Yarde just happens to be with the right people at the right time. Reeves says that twice previously he had accepted an offer to fight Yarde, but claims his rival’s manager and trainer Tunde Ajayi had refused the fight. He explained: “All I know about Anthony is that we were scheduled to fight two times before, but the fight never took place for some reason. “Frank wanted this fight to happen before, but I guess his trainer and manager didn’t feel the fight was appropriate at the time. His trainer knows that Anthony is in for a fight. 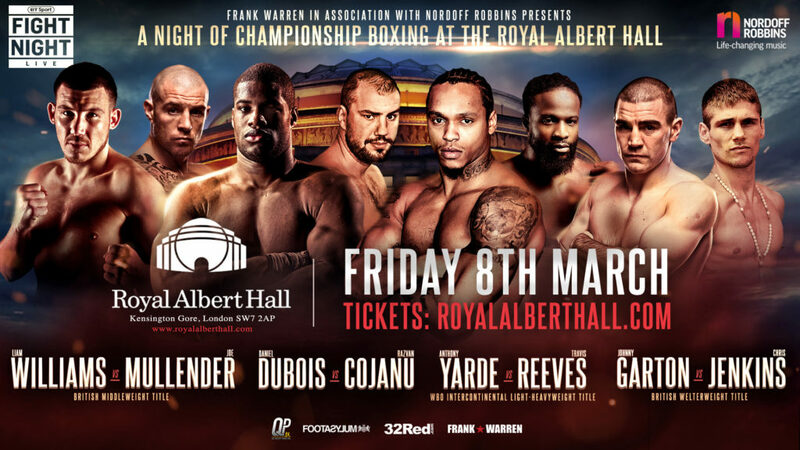 Yarde’s WBO intercontinental light-heavyweight title defence against Reeves takes place at the Royal Albert Hall on Friday March 8, live on BT Sport. Daniel Dubois v Razvan Cojanu and Johnny Garton defends his British welterweight title against Chris Jenkins on a huge night of boxing that also includes the British middleweight title clash between Liam Williams and Joe Mullender. LIAM WILLIAMS has ripped into big fight rival Joe Mullender telling him: “You can’t punch and you’ve got no skills.”Williams makes the first defence of his British Middleweight crown against the Essex man at London’s Royal Albert Hall on Friday March 8. Mullender has earned a reputation as one of boxing’s tough men, but the Welshman who beat Mark Heffron in December to become British champion roared: “That’s not enough. “He has fought no one, he can’t punch, he has got no skill. He is just very fit and tough. Mullender believes aggression that has served him well in his career will be a shock to the system for Williams, and the key to causing a big upset in the BT Sport televised fight. Williams added: “Joe is a pressure fighter, but I don’t think he will be so keen on that once I start landing. “Maybe he is as tough as he says and can keep going forward. Boxing isn’t just about going forward and taking three shots to land one. “If he was a massive puncher, then yeah you can try that, but he isn’t a big puncher.He isn’t going to see the final bell. Williams is now settled at his Sheffield training base under Dominic Ingle where he trains alongside Nicola Adams, Willy Hutchinson, Billy Joe Saunders and Kid Galahad who is soon to challenge IBF Featherweight champion Josh Warrington on a Frank Warren bill. He is close to all his gym-mates, particularly Hutchinson who he shares a flat with in the Steel City. Williams says: “I spend a bit of time with Billy Joe and Kid Galahad. Recently Willy moved into a flat with me. “Willy is a bit messy and leaves plates so I have to tidy up, but he is only 20. “I am like the Dad of the house. I’m usually the child when I’m back home because my Mum does everything for me, but it is me running round after Willy here. Elsewhere on the show, Anthony Yarde will defend his WBO Intercontinental title against Baltimore’s Travis Reeves. Daniel Dubois follows in the footsteps of British heavyweight greats to fight at the historic venue and takes on Razvan Cojanu in his tenth fight.